I grew up in a small sect (non-institutional churches of Christ) within the Stone-Campbell Movement, known otherwise as the “Restoration Movement.” My grandfather and father are both ministers within this movement and at the age of 16 or so I began the process of preparing for a life of preaching. I was that kid who sat in high school with a commentary on Isaiah and an open Bible, fiercely scribbling notes for my next sermon. I was shown a lot of grace those first few years at my home congregation and other congregations throughout the state of Arkansas. It was during these formational years that I ran across C. S. Lewis and quickly devoured The Screwtape Letters and Mere Christianity. This was the first time I had seriously engaged with someone from outside of my tradition, and I came away having learned a lot and questioning a lot. In the group I grew up in, we were the only ones who had the Truth, and all other denominations were wrong about pretty much everything. It was also at this time that a girlfriend’s father introduced me somewhat hesitantly (I now know why!) to philosophy. I was soon off to Florida College where I spent two years in the Biblical Studies program. Here, I was first faced with the problem of modern biblical criticism. I did not feel that biblical criticism was ever critiqued adequately at the college. Basically, biblical criticism was “liberal,” and therefore wrong. Similarly, my theology classes exhibited a poor understanding of the texts and a superficial engagement with other interpretive traditions. At this time, I began researching the history of the Restoration Movement, and I found a lot of disconcerting things (e.g. what the founders of the Restoration Movement actually believed and did!). Outside class, I was exposing myself to folks like Yancey, Bonhoeffer, Brueggemann, Barth, and other evangelical voices. I have posted on a former blog of mine that Yancey saved my soul. It was Yancey who introduced me to Bonhoeffer, Barth, and other writers. And it was really St Paul and Yancey who taught me about grace. I also began reading about the “emerging church,” and I found a resonance with postmodern sensibilities. What was helpful was not Brian McLaren et al., but what they were reading. I began the summer after my sophomore year reading N. T. Wright, Stanley Hauerwas, Richard Hays, John Howard Yoder, Lee Camp, Miroslav Volf, Lesslie Newbigin, Stanley Grenz, Marva Dawn, and others. I transferred for my junior year to Western Kentucky University, majoring in Religious Studies and Philosophy. It was at Western Kentucky that I began making my break with the tradition of my youth. I soon ended up in a progressive evangelical church. It was here that I learned very quickly that I was not really as “progressive” or “evangelical” as I thought, and I became disillusioned with the emerging church. I discovered that it felt and reasoned a lot like liberal Protestantism. So I began the process of trying to discern which tradition made the most sense to me, and which tradition I would feel comfortable ministering in (not that ministering is ever comfortable!). This seems a bit pragmatic now, and I freely admit that it was. I visited Disciples of Christ, Methodist, and Episcopal churches. But I felt at odds with what I found at each church, especially with a poor view of Scripture and of the basic orthodox Christian doctrines. I was basically a sacramental and liturgically minded Anabaptist wannabe (kind of Hauerwasian, eh?). But when a friend said that he was prepared to stay evangelical even if it meant reforming almost every church he pastored, I knew that I needed to join a historical Christian tradition. I immediately turned to Orthodoxy (having already read Fr. Schmemann’s For the Life of the World), and began devouring books about Orthodoxy (Metropolitan Kallistos Ware, Vladimir Lossky, Fr. Georges Florovsky, Daniel Clendenin, Fr. Thomas Hopko, Frederica Matthewes-Green). I also attended my first Divine Liturgy, and after that experience – and talking with converts from Lutheranism and Anglicanism – I was on my way into a serious investigation of Orthodoxy. I have not been to another service besides an Orthodox Liturgy since. I did not become Orthodox to escape Western problems or to run into a cultural ghetto (God forbid!). I became Orthodox because I felt that I had encountered the early Christian Church. I became Orthodox because I had to repent to enter the kingdom of heaven. I became Orthodox because I found a spiritual father in my priest. I became Orthodox because I knew that through the grace of God one could actually become a saint. I became Orthodox because I became – in a real sense – contemporaneous with the Fathers of the Church. I am grateful for all the Christian traditions that have shaped me. 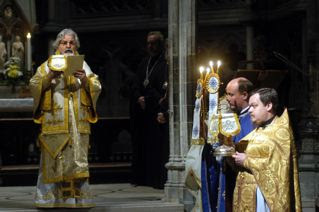 But I’m joyful about my entrance into the Orthodox Church, and I fervently pray for the salvation and unity of all.